It is worth exploring documentary companies' websites for discs which may easily be missed. A batch of DVDs received from this enterprising firm has given us considerable interest and pleasure. 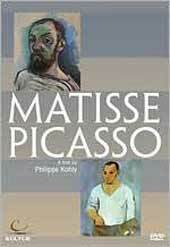 There is a documentary component to them all, purely so in Matisse Picasso, directed by Philippe Kohly. 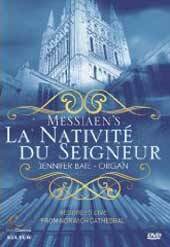 This is a most enjoyable film recording for TV of a thoroughly commanding, devotional and moving account of one of Olivier Messiaen's most well-known and highly-favoured organ works, a cycle of nine meditations on the Christmas message. The presentation on this hour-long DVD is, for the most part, unfussy and business-like, allowing ample observation of Jennifer Bate in action at the mighty Norwich console; this is especially rewarding, because the often complex and tricky management of the instrument itself - particularly throughout the course of a timbrally complex cycle such as this one - is a thing rarely seen (as indeed, much of the time, is the organist! ), and more or less impossible to appreciate unless one happens to be a player oneself. The recorded organ sound is close and clear throughout, and Bate's great love of the music and sheer joy in performing are strongly evident; it is indeed no wonder that Messiaen himself came to regard her as his 'organist of choice'. In her hands, the music hangs timelessly in the air,breathes, dances and sometimes thunders with terrifying weight. I hope very much that there will be further releases of this kind: it would be fascinating, for instance, to see Bate in action performing those cycles which require a really heroic level of concentration and organ-management, such as "Meditations sur le Mystere de la Sainte Trinité" and the monumental "Livre du Saint Sacrement". There are only two small things which I found a little irritating in this video: the appearances, on screen, of the biblical quotations relevant to each movement, which interrupted the visual flow, coming, as they did, only a few seconds after each movement began - it would have been more satisfactory to have seen these quotations together with the titles; and I could have done without some of the non-organ-focussed visuals, i.e. the filmed wildlife seen during the fourth movement, "Le Verbe". 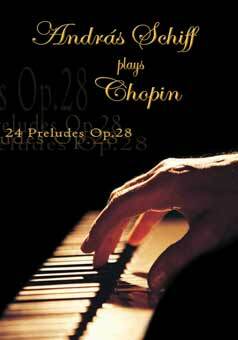 This is a strange production with important shortcomings, but it will give great pleasure to purchasers who don't know too much about Chopin and will enjoy hearing some of his music on unusual instruments. Andras Schiff combines a recital of all the Chopin Preludes filmed in the restored Concert Hall of the Ancien Conservatoire in Paris, where Chopin himself frequently gave concerts, with a biographical TV lecture on Chopin's life which has quite a few points that were new to us..
" - - the prime critical importance lay in the two pianos played, which brought an audience, most of whom were probably uninvolved in the 'authentic instrument' controversies, face to face with thinking about possible alternatives to the ubiquitous Steinway. As Schiff put it, with gentle good humour, we have been brainwashed into taking for granted that pianos should always be black and made by Steinway - - ". The recorded sound on the DVD is good but, in truth, not greatly different from that of the Steinway on which are played most of the lecture illustrations (partly with voice over). Schiff's easy-going commentary goes smoothly, talking over excerpts (only !) of the 25 items listed in the booklet.
" - - pyrotechnic acrobatics characterised by sheer velocity and power - - He pounded the keyboard so that the fast ones thundered by with often idiosyncratic emphases, and the tiny slow pieces, some of which every child used to learn to play - - were expanded and distorted to the limit of self indulgence. One was left wondering if Kissin had ever interested himself to play instruments of Chopin's own time or to think about how the Preludes might have sounded when new? ". Schiff's account of the Preludes is characterised, on the other hand, by inwardness and ease of execution, the sound sufficiently different from a Steinway as to encourage attentive listening to this so familiar music, a pinnacle in Chopin's oeuvre. 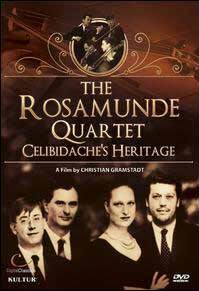 The Rosamunde Quartet’s promotional DVD certainly gives an interesting insight into their four way marriage. To be commended is that it does not gloss over the more gritty aspects of their profession. The quartet do not always agree; constantly striving for the best, heated debates flourish. However their mutual respect, shared humour and the satisfaction they gain from their artistic connection are highly evident. Snapshots of how music fits into their everyday lives are intriguing. Brutally honest, Anja Lechner admits she was not a prodigy; cello was something she had to work hard at to master. Simon Fordham practices Japanese calligraphy in his spare time; the proportion, clarity and control required for this mirroring his role as second violinist in the quartet. Similarly their viola player, Helmut Nicola, finds balance and tranquillity in nature. Andreas Reiner, a driving force, not only leads the quartet but has also founded his own record label. Shared by all four is a reverence for their late mentor, Sergiu Celibadache, as well as a love of sushi! Two Dance discs are very different from each other. Hans van Manen Festival [Digital Classics DC10040] celebrates the Dutch choreographer's 75th birthday with a magnificent gala event filmed in Amstedam, 2007. The range of music was wide, with the scores for Satie's Gnossiennes, the collaborative Simple Things and Twilight to Cage's Sonatas for Prepared Piano outstanding, and footage with van Manen himself at work gave it all context, explaining the affection and esteem in which he is held. The dance interpretation of the slow movement of the Hammerklavier sonata (illustrated) was delightfully expressive, even though the piano playing sounded wooden after recently enjoying Barenboim's recital DVDs from Berlin. The costuming throughout all these items contributed substantially to the whole. The Video Dictionary of Classical Ballet [Kultur D1100] is a wholly didactic 4 hour compilation of 800 + movements in Russian, French and Cechetti styles, illustrated by former principal dancers of important companies. It is done very well. For those of us who have enjoyed watching ballet without understanding its private language, this double DVD is illuminating and unexpectedly compelling to watch. With contributions from Henri Matisse, Pablo Picasso, Maya Widmaier-Picasso, Claude Picasso, Jacqueline Matisse-Monier, Pierre Daix & Hilary Spurling, this is a compilation from French TV films, archive materials and interviews, most interesting the first hand recollections by family members, in particular Françoise Gilot, Picasso's partner 1945-53. Philippe Kohly's focus is on personalities, drawing the viewer into a magic inner circle. This intelligent film succeeds in creating a path into the appreciation of two seemingly divergent and divrse artists.The judicious selection of works by both artists makes the case for a special relationship between the two based on lifelong mutual esteem. Statistics for museum attendances suggest that there exists a hunger for visual arts, yet many people have little or no opportunity to visit museums. This DVD should have a ready and appreciative audience.